Yesterday, Secretary Pritzker released the U.S. Department of Commerce’s fiscal year 2016 budget request. The FY 2016 budget request supports and builds on President Obama’s vision for creating economic opportunity that will benefit all Americans. The budget includes critical funding for key Commerce priorities, including promoting trade and investment, fueling our data-driven economy, and spurring innovation. The U.S. Commerce Department plays a critical role in promoting U.S. economic growth and providing vital scientific and environmental information. 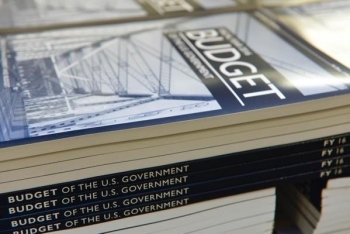 The FY16 budget request directly aligns with the Department’s “Open for Business Agenda,” which reflects Commerce's role as the voice of business and the Obama Administration’s focus on economic growth and job creation. Manufacturing is critical to innovation since it creates new growth industries, jobs and strengthens our economy. The budget supports the expansion of a National Network for Manufacturing Innovation (NNMI) with up to 45 manufacturing innovation institutes across the nation. In total, the budget includes discretionary funding for seven new institutes, including $140 million for the first two Commerce-led institutes, and an additional $1.9 billion mandatory proposal to fulfill the President’s vision. NNMI has kept America on the front-lines of discovery, which has resulted in our businesses, our manufacturers, and the American economy globally competition in the 21stcentury economy. The budget also invests in the Economic Development Administration (EDA) to support innovative economic development planning, regional capacity building, and capital projects, which includes the Regional Innovation Strategies Program. This program promotes economic development projects that spur entrepreneurship and innovation at the regional level, which has resulted in the establishment of proof-of-concept centers that foster the rapid commercialization of research and startup creation; The feasibility and planning of new research parks where academic and industry can collaborate; and Providing technical assistance for regions wanting to establish seed-capital funding programs for startups. Additionally, the budget provides $49 million for NTIA, which is a demonstration of the Administration’s continued commitment to broadband telecommunications as a driver of economic development, job creation, technological innovation, and enhanced public safety. The President’s broadband vision of freeing up 500 MHz of Federal spectrum, promoting broadband competition in communities throughout the country, and connecting over 99 percent of schools to high-speed broadband connections through the ConnectED initiative will create thousands of quality jobs and ensure that students have access to the best educational tools available. Lastly, through the implementation of the America Invents Act, the U.S. Patent and Trademark Office (USPTO) continues to make it easier for American entrepreneurs and businesses to bring their inventions to the marketplace sooner, converting ideas into new products and new jobs. The budget allows USPTO to fund operations and to further implement administrative actions proposed by the President’s Patent Task Force. The USPTO offers countless resources such as, the Track One Prioritized Examination Program, which allows small businesses to get a final disposition within about twelve months. Learn more about the fiscal year 2016 budget request and the many ways it supports the Department of Commerce’s mission. U.S. Commerce Secretary Gary Locke and Under Secretary of Commerce for Intellectual Property and USPTO Director David Kappos hosted a conference call with reporters today to discuss the administration’s support for pending patent reform legislation and why the administration believes patent reform is critical to promoting innovation and creating jobs. On Monday, the Senate began consideration of S.23 – now known as The America Invents Act – and the administration released a Statement of Administration Policy expressing support for the proposed legislation. While the USPTO has made significant strides in reducing its backlog of more than 700,000 unexamined patent applications and the time it takes to process a patent, reforming the patent system is critical to speeding the transformation of an idea into a market-making product that will drive the jobs and industries of the future.